THOUGHT LEADERSHIP: COATINGS & CORROSION CONTROL tors, as well as coatings manufacturers including Hempel are going to be able to continue to adapt and meet yet more stringent environmental regulations in future. The IMO has now committed to reducing total annual greenhouse gases (GHG) emissions from the commercial shipping industry by 50 percent com- pared with 2008 levels. Doing so will mean reaching peak emissions as soon as possible, before radically reducing all GHG emissions across operations. The target has been set in line with the United Nations Paris Agreement, and was rati? ed – in a very positive sign – with very little objection. Re- porting suggests that from the absolute reduction in emissions, the strategy pre- scribes a 40 percent energy ef? ciency improvement by 2030 compared with 2008, pursuing efforts for a 70 percent improvement by 2050. Achieving this will require all across the maritime in- dustry to work in the spirit of collabo- ration to develop new and improved solutions. 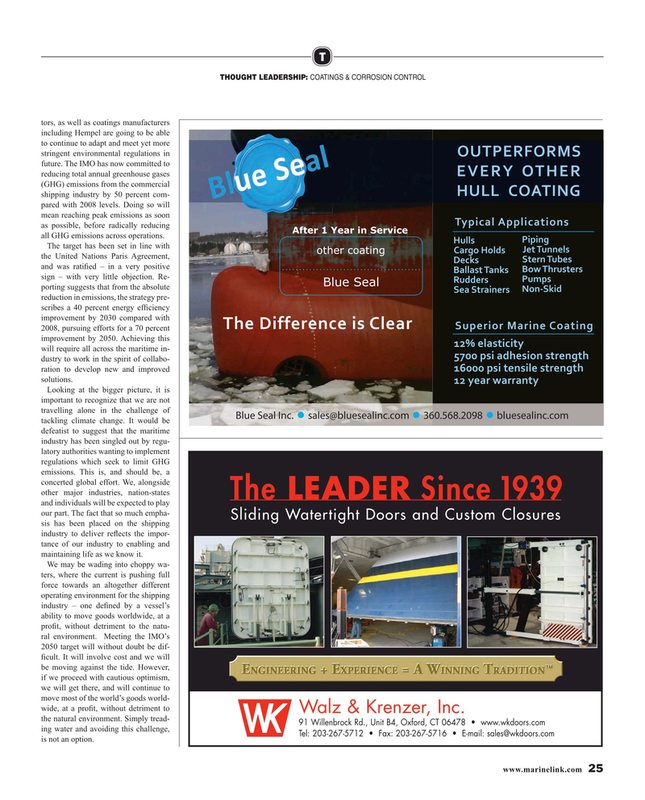 Sliding Watertight Doors and Custom Closures sis has been placed on the shipping industry to deliver re? ects the impor- tance of our industry to enabling and maintaining life as we know it.